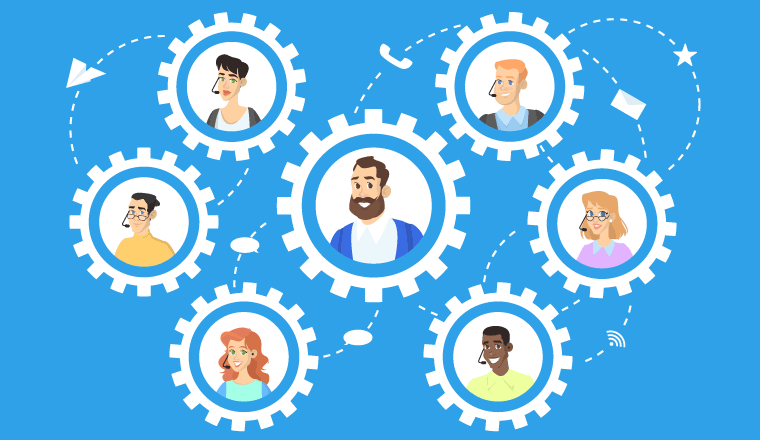 In this article, we answer the question: what is workforce management (WFM) in the contact centre? We also take you through all the basic WFM components. 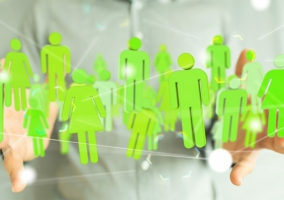 Workforce management (WFM) is a term that encompasses all of the processes that a contact centre undertakes in order to have the right number of staff available at the right time. In essence, it is all about assigning the right employees with the right skills to the right job at the right time to meet demand. While these WFM processes may seem like a lot to take on, in essence, it is all about assigning the right employees with the right skills to the right job at the right time to meet demand. Let’s now inspect each of these WFM fundamentals a little more closely, starting with the basics of contact centre forecasting. 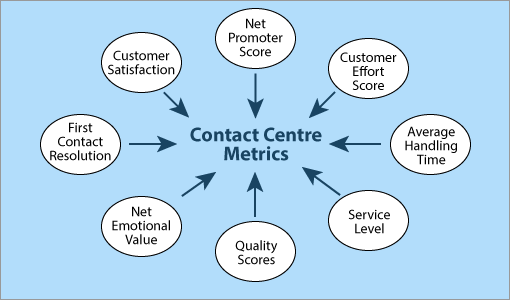 In the contact centre, forecasting involves the calculation of future contact volumes. While many contact centres will use WFM systems to automate this process, most do it through Excel spreadsheets, as found in our poll below. To do this, many contact centre WFM teams will use the method below. There are four fundamental steps to forecasting using spreadsheets, each of which is explained below in simple terms. Take a look at your annual contact volumes from the last three to five years. Then create a high-level forecast of projected volume. The data can be pulled from the contact centre’s Automated Call Distribution (ACD) system or its Call Detail Records (CDRs) or it can be obtained by contacting the telephone company. Again, using your historical data, you will be able to calculate what percentage of your annual contact volumes usually falls during each month. Then you would multiply your forecast annual contact volume by the percentage expected each month to split your annual estimation into 12 separate forecasts, based on seasonality. For example if we usually receive 10% of our annual traffic in January and we forecast 100,000 calls for next year, next January we would make an estimation to receive 10,000 calls. To split these monthly contact volumes into daily volumes, we cannot just divide by however many days there are in that month because you will get more traffic on some days than others. So, it is once again time to analyse our data to identify how contact volumes are spread across the week and use this analysis to daily forecasts. Using your analysis, the contact centre must then work out the number of contacts expected during each reporting period (normally 30 minutes). Daily reports from your ACD system should provide the contact centre with the right insight, as historical data is provided in half-hour segments. 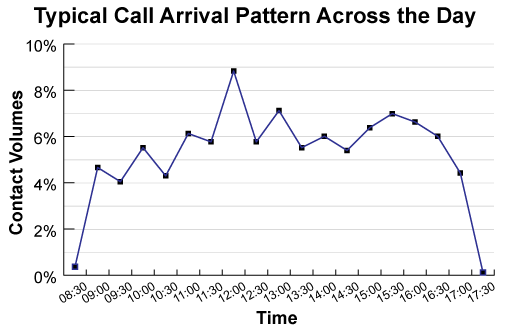 However, if not, the contact centre will have to put together a call-arrival pattern, similar to that below. The WFM team must then staff to fit these reporting periods and create advisor schedules. 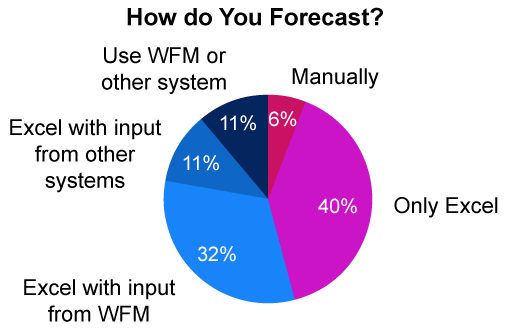 You can also use WFM tools to automate the forecasting process. Try out our free online forecasting tool to save yourself some time. There are two key parts to creating advisor schedules that the WFM team must consider; finding out how many advisors are needed during each reporting period and designing shift patterns. If you are a WFM planner that does not have access to a WFM system, the Erlang Calculator will become your best friend. 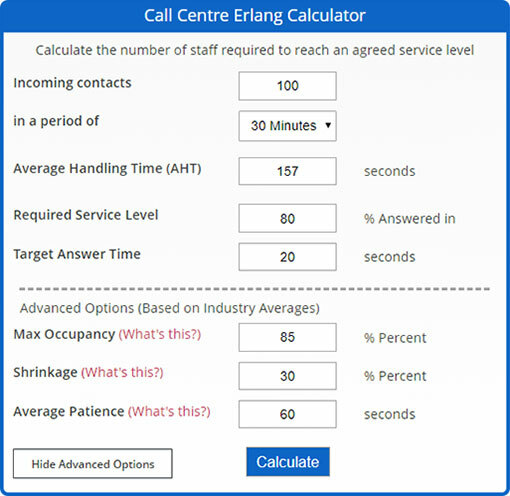 An Erlang Calculator helps the contact centre to calculate the number of staff needed to handle a forecast number of calls, while meeting a given service level and queue time. Once these details have been entered, the calculator details the number of advisors needed to handle the expected call volumes over the reporting period, which in the example above is 30 minutes. The calculator will also give exact figures for service level and occupancy, as you cannot expect to hit the targets that you entered into the calculator because you cannot have a decimal point number of advisors staffing the contact centre. The full results that the Erlang Calculator would provide from the data included in the picture above is shown below. We now know how many advisors that we need during every half-hour period across each day, so it’s time to think about shift patterns and specifically these two things: what works for the company and, more importantly, what works for the advisor. After all, we need to design shifts so advisors want to work them; we can maximise their efficiency afterwards. Different contact centres choose to utilise different shift patterns based on the preferences of their team. In fact, there are seven common options that the WFM team can choose from, as highlighted in the graphic below. Whatever shift pattern your WFM team chooses to employ, make sure that you design that pattern to suit certain lifestyles and recruit specifically for those lifestyles. For example, if you choose to employ part-time shifts, university students may well be best placed to work those shifts, as it suits their lifestyle to earn some money as they study – so target them in recruitment. The key is to have a “target market” of potential advisors whose lifestyle perfectly fits with the shifts that you design. The key is to have a “target market” of potential advisors whose lifestyle perfectly fits with the shifts that you design. Also, there are other things to consider, such as what time the local buses run. If the last bus out of your town/city leaves at 7:55pm and you have a shift that finishes at 8pm, you will be turning away a whole host of applicants for that role. 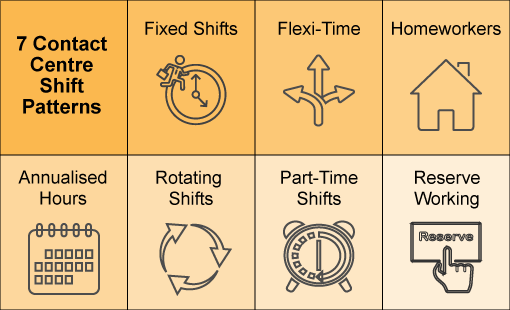 In this sense, shift patterns have a great deal of impact on advisor satisfaction, so choosing the right pattern and adding flexibility, such as a shift swap functionality, will really help to reduce schedule dissatisfaction. Intraday management is the reactive part of WFM. While we’ve done our best to build schedules around forecasts, in the contact centre anything can happen. If any of these incidents occur, it is up to the WFM team to restore order to the contact centre, whether that’s by drafting in additional advisors, promoting self-service or finding other solutions to the specific circumstance. It is good practice for WFM teams to put Standard Operating Procedures (SOPs) in place for each of the scenarios above, giving directions about what to do in every individual situation. Also, SOPs can be created to provide guidelines for what to do when lines are quieter than expected and what duties should be fulfilled. While intraday management is the reactive part of WFM, you do have to prepare for the unexpected to some extent, especially when it results in the loss of technology, loss of staff or a loss of premises. This is often called Business Continuity Planning or Disaster Recovery Planning. Again, this makes up a big part of the duties of a workforce planner, as you create plans for how to deal with disaster situations and role play scenarios to ensure that your plan is effective. While the likelihood of any of these disasters will vary from one location to another, your Business Continuity Plan will need to be an all-encompassing document that identifies any type of disaster, the impact of that disaster and the recovery procedures. While we have discussed each of the truly fundamental parts of WFM, some contact centres with large WFM teams often task them with additional responsibilities. These may include the following. Some contact centres will take the view that ensuring that the advisor “workforce” is meeting its performance targets is a part of the WFM, while others will have a specific “quality” team to do so. Nevertheless, whoever is tasked with performance management will also track performance-based metric scores and run quality analysis (QA). The metrics that a performance manager would typically track include First Call Resolution (FCR), Net Promoter Score (NPS) and Customer Satisfaction (CSAT), amongst others. These help the contact centre to identify the impact advisors are having on success, loyalty and general satisfaction. The WFM team (or quality team) will also monitor a few advisor calls (e.g. six calls per advisor, every month) and coach them on how they can improve while also letting them know what they did well. In fact, most contact centres give advisors quality scores after monitoring, which are then used to identify which advisors may need extra support and highlight those that may deserve a reward. While this may be a job for team leaders, it is also good for the WFM team to track absenteeism and time-keeping, as they may need to account for that when creating schedules. Keeping an eye on metrics such as attrition and absenteeism is important, as the WFM team has a vested interest in advisors sticking to their working schedules. In fact, keeping an eye on metrics such as attrition and absenteeism is important, as well as service level and occupancy in real time, as the WFM team has a vested interest in advisors sticking to their working schedules. To counter this disruption, many contact centres are now introducing a shift-swap scheme or an annualised hours initiative, as was discussed in the scheduling section of this article. What Can a WFM System Help Me With? While the Erlang Calculator is great for traditional contact centre environments, many contact centres choose to use WFM solutions to run more complex calculations. Using these solutions, the contact centre will be able to follow the “Workforce Management Cycle” to successfully optimise the workforce. Using a WFM solution as a workforce optimisation (WFO) strategy is an iterative cycle, requiring several key processes to be completed so that service levels can be fulfilled and costs can be managed. But gaining feedback from each stage means that the contact centre can continually improve its efficiency and become more confident in future staffing level predictions. Simply put, a WFM system will help to increase efficiency, make quicker solutions while reducing personal and management costs. Where Does Workforce Optimisation Come In? Workforce optimisation refers to the integration of new processes and/or technologies into the contact centre, with the aim of improving operational efficiency. Traditionally, WFO is achieved by having the correct number of staff in place to meet the forecast demands of the activity. In the contact centre, this usually means having the most accurate number of advisors in place to deal with our expected contact volumes, which is calculated by using either an Erlang Calculator or WFM software. Originally published in July 2016. Recently updated.